Motor cruising holidays provide a leisurely way to experience the picturesque and historical marvels of mainland Europe. It is unusual for a holiday charter firm to specify that holidaymakers need to have skippering experience before helming one of their vessels. The range of boats will have been chosen for their ease of navigation and the company will give a brief training and safety lesson before the voyage. Hire boats should be fully insured and holidaymakers will likely only be responsible for any damage up to the amount of the security deposit. As a rule most European countries do not require a driving permit to cruise down their waterways. The popular boating nations of France, Holland and Italy, for example, are all exempt. In Germany a permit is required in certain areas for boats over 13 metres in length. Hire companies will advise their customers on local laws and if necessary will provide a temporary permit for the duration of a holiday. The International Certificate of Competence (ICC) is a documentary assurance from one government to another that its holder meets the regulatory competency levels and is issue by the Royal Yachting Association (RYA). The permit will allow the holder to cruise down permit-restricted foreign waterways and provide necessary official reassurance to charter companies of the driver’s competency. This is especially important when cruising in more challenging waters and chartering vessels requiring greater experience. The ICC is highly recommended for motorboat owners who plan to take their vessel overseas. Most hire companies will choose cruising waters that are not liable to unnerve their customers and so they will largely be non-tidal with only the lightest of currents, making them particularly easy to navigate. Locks will often be encountered on the journey but many of these will either be operated by lock keepers or will operate automatically upon approach. There are some that are self operated but the hire company will provide a simple demonstration before the voyage that will ease any worries about operating them. Locks also provide a fun way to meet other travellers.Mooring will likely present few concerns or problems en route as there is an abundance of free moorings all along most waterways across Europe, whether at a marina or in the open countryside. The more popular mooring centres may ask for a small fee. The most popular destinations for motor cruising holidaymakers are Belgium, Holland, France, Germany and Italy and there are a number of charter companies that reflect these cruising needs. The north-west France region of Brittany is particular favourite of cruisers. It has over 600 km of canals and rivers that wind through unspoilt medieval villages and countryside and has a temperate climate with long hours of sunshine in the summer. The chocolate, beer and sprout paradise of Belgium offers holidaymakers lush green countryside and historic towns and cities, from the ancient Flemish capital of Gent to the ‘Venice of the North’ Bruges. 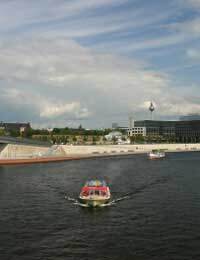 The fascinating city of Berlin is an ideal spot for a motor cruising because not only is it possible to explore the historic monuments of museum of the German capital from its central waterways the River Spree and the Landwehrkanal, but boaters can then head out into the glorious unspoilt network of rivers and lakes that surround the city. Boating is synonymous with traditional Dutch and Italian culture and this is an aspect stunningly reflected in the celebrated water cities of Amsterdam and Venice. Motorboating is the perfect way to discover the traditional heart of a country beneath the trappings of modern development, and at a more traditional pace.